Health Should you Excercise when ill? I know it’s only September and winter viruses seem a long way off but these days they can strike at any time. 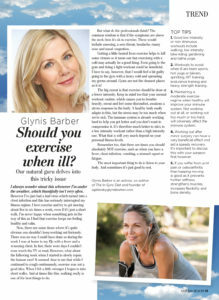 The illness I talk about below in my article for Natural Health magazine struck in early summer when I least expected it. I always wonder whether to exercise or not whenever I’m under the weather, which thankfully isn’t very often. Then out of the blue in early summer I got a bad virus which turned into a chest infection and this seriously interrupted my fitness regime. I love exercise and try to get moving about five to six times a week, even if it’s just a short walk. I’m never happy when something gets in the way of this as I find that exercise keeps me feeling healthy and calm. Now, there are some times where it’s quite obvious you shouldn’t keep working out furiously. There was no way I could have done so during the week I was at home in my PJs with a fever and a wheezing chest. In fact, there were days I couldn’t even watch the TV or read. However, what about the following week when I started to slowly rejoin the human race? It seemed clear to me that while I continued to cough continuously, exercise was not a good idea. When I felt a little stronger I began to take short walks. And at times like this, walking really is one of the best things to do. The common wisdom is that if the symptoms are above the neck then it’s ok to exercise. These would include sneezing, a sore throat, headache, runny nose and nasal congestion. Getting a little heated from exercise helps to kill some viruses so it turns out that exercising with a cold may actually be a good thing. Even going to the gym and doing a light workout could be beneficial. I have to say, however, that I would feel a bit guilty going to the gym with a heavy cold and spreading my germs around. Gyms are not the cleanest places as it is! The big caveat is that exercise should be done at a lower intensity. Keep in mind too that your normal workout routine, which causes you to breathe heavily, sweat and feel some discomfort, awakens a stress response in the body. A healthy body easily adapts to this, but the stress may be too much when we’re sick. The immune system is already working hard to help you get better and you don’t want to compromise it. It’s therefore much better to stick to a low intensity workout rather than a high intensity one. What that is will very much depend on your personal fitness levels. Remember too, that there are times you should absolutely NOT exercise, such as when you have a fever, chest infection, vomiting, a stomach upset or fatigue. The most important thing to do is listen to your body. And sometimes it’s just good to rest. Good low intensity or non-strenuous workouts include walking, low intensity bike riding, gardening and hatha yoga. Workouts to avoid when ill are team sports, hot yoga or bikram, sprinting, HIT training, endurance training and heavy strength training. Maintaining a moderate exercise regime when healthy will improve your immune system. Not working out at all, or working out too much or too hard, will adversely affect the immune system. 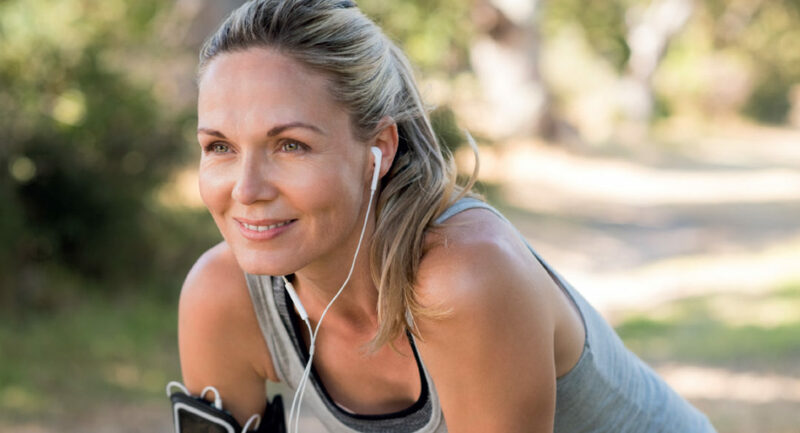 Working out after minor surgery can have a very beneficial effect and aid a speedy recovery. It’s important to discuss this with your surgeon first however. If you suffer from joint pain or osteoarthritis then keeping moving is good as it prevents further stiffness, strengthens muscles, increases flexibility and bone density. Natural Health – Should You Excercise When Ill?